These mid-summer tomatoes look so delicious. I like how this small workshop owner always grows spectacular sidewalk plants. With @luismendo visiting from Amsterdam, my Tokyo DIY Gardening pal Chris and I took him on a tour of Harajuku backstreets looking at gardens, eating tonkatsu, and stopping for some excellent cold coffee. Harajuku is fun because the residential area has houses and gardens from all or almost all the past eight decades. 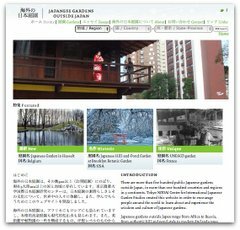 The Harajuku gardens that appeal to me are similar to ones elsewhere in Tokyo for their simplicity and easy adaptation to urban life. Some results are clearly unintentional. My photos include a three story garden of ivy and bamboo that covers one house and provides a buffer with its neighbor, a sleek concrete building’s balcony green curtains that are just starting to fill out on two floors, a blue flowering vine that somehow became a giant bush, a tiny entrance garden outside a pre-war house that has been converted into the very elegant Omotesando Coffee. We also explored the enormous Danchi that between 246 road and Harajuku. This sprawling bauhaus-like public housing project has a wonderfully chaotic and varied set of gardens created by generations of residents. In July, we spotted lots of tomatoes, vertical bitter melon, and these purple gloves on top of an ad hoc garden support. 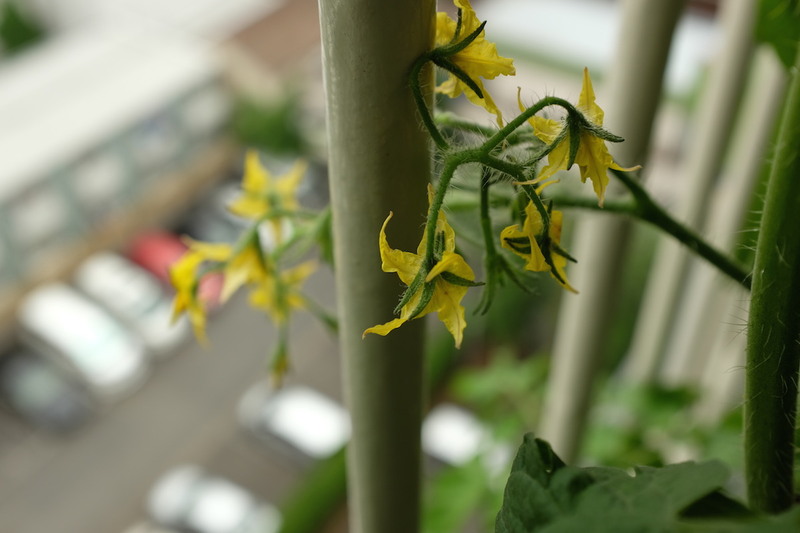 This tomato starter plant, also bought at Shimachu, is flowering and already has several mini-tomatos despite its tiny size. So much engineering to create commercial food, even the ones we grow ourselves. Fox face is a common fall plant that city residents bring into their homes. I was surprised that it does not require water, and will last two months. 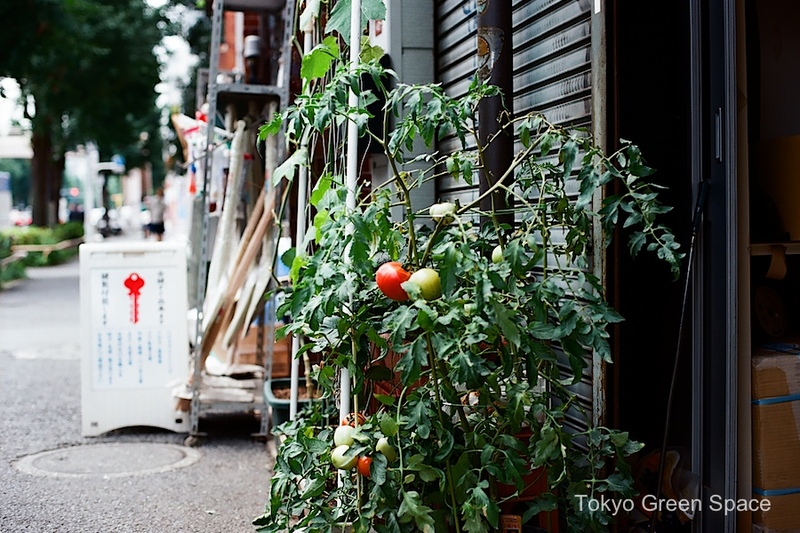 It is a fruit related to eggplant and tomato, and has the name “fox face” because of its resemblance to the animal. Some of the fruits have what appear to be ears, but not this one. It make a nice alternative to pumpkins. I recently had the chance to meet Professor Mori Yuichi of Mebiol, an agriculture technology company in Kanagawa. This research professor at Waseda University started Mebiol in 1995 exploring first medical and then agriculture uses for hydrogels. I was intrigued by his Hymec system for indoor farming and Skygel for rooftop gardens. Hymec looks like a plastic sheet allows for no-soil and low-soil farming, with the water and fertilizer separate from the plants roots. The roots remain dry while drawing water and nutrients from below the membrane, and oxygen from the air. Lettuce and other leaf vegetables can be grown with no soil, tomatoes with a thin layer of soil. 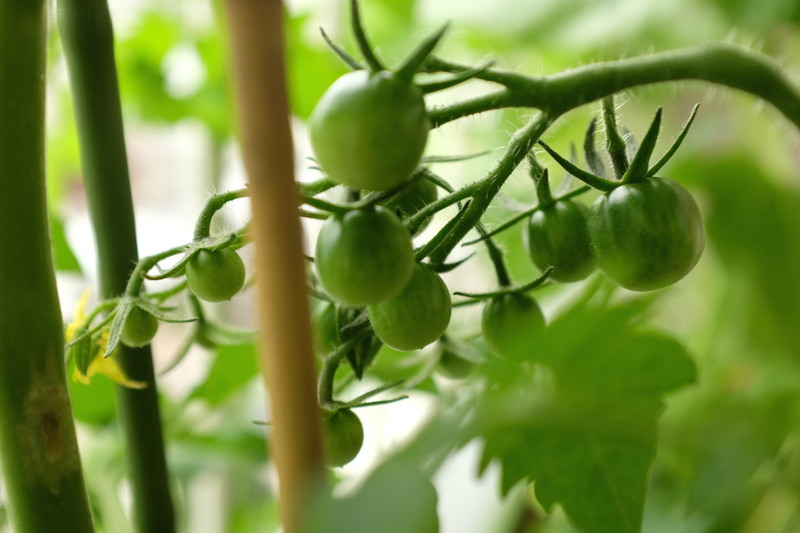 Compared to other indoor farming techniques, Hymec uses less water, less fertilizer, less insecticides and less energy because the barrier prevents contamination from bacteria common to traditional hydroponics. 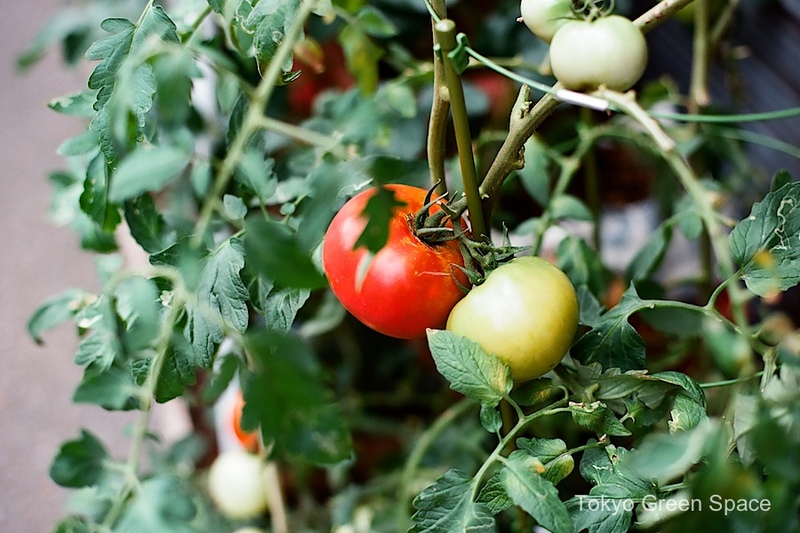 Benefits include the ability to plant smaller seedlings (called “plug seedlings”), greater plant density, and more nutritious and sweeter vegetables, with tomatoes producing more Gaba and Lycopene. I was intrigued by what Professor Mori calls “mobile farming.” In his words, “Hymec releases farming from the earth by a water-proof sheet” and allows farming in cities, factories, deserts, indoors, and even in waste incinerators. 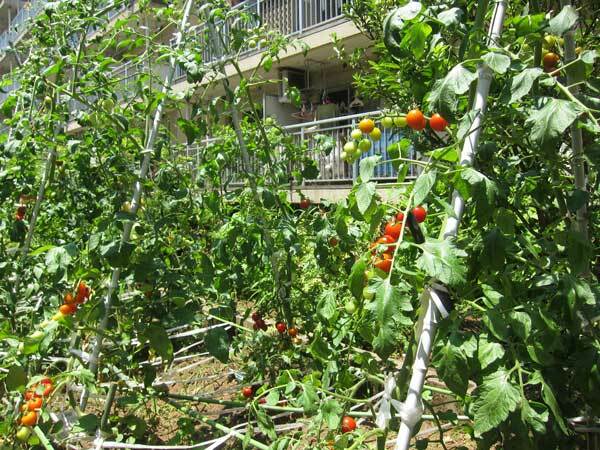 Some applications are the Kyoto Brighton Hotel, where tomators are grown on a concrete floor in a bamboo greenhouse, and a test farm in Dubai, where Hymec makes possible low-water farming with reduced air conditioning, and replaces costly and carbon-heavy vegetable imports from Europe. Another Mebiol product is Skygel, mixed with soil and used for roof and slope planting. In this case, the hydrogel increases water retention, lowers run-off, and decreases the need for irrigation. Mixing Skygel and soil allows for a lighter load, ideal for roof gardens. The roof garden at Mebiol’s office (in top photo, with founder Professor Mori), is only 10 cm thick, and the plants can survive for up to 10 days without water in the Japanese summer heat. Below is a diagram explaining Hymec.